The Gettysburg Address was a defining moment in the Battle of Gettysburg event and historically significant. Following the Gettysburg battle on July 3rd, 1863, its impact grew quickly. Both sides had left thousands of dead soldiers and animals scattered throughout the area; in the Summer sun, bodies and animal carcasses were beginning to bloat and decay. David Wills, a local Gettysburg judge, was asked by Pennsylvania Governor Andrew Curtain to quickly oversee cleanup efforts. Wills contacted many of the states represented by the dead, and they agreed to help create a national cemetery. Meanwhile, many locals, such as Elizabeth Thorn, began to help with the cleanup. Just over 4 months later on November 19th, President Abraham Lincoln visited Gettysburg to dedicate the site as a National Cemetery. The featured speaker was the then famous orator, Edward Everett. Everett's speech took about two-hours, whereas Lincoln's was about two minutes. Many people, not realizing that he had even spoken, failed to applaud and acknowledge the his speech. However, Everett, being nearby was moved and wrote a note to Lincoln the next day saying,"I should be glad if I could flatter myself that I came as near to the central idea of the occasion in two hours as you did in two minutes." Though President Lincoln was not the featured speaker, his address, a few remarks that were short and succinct, was the most memorable. 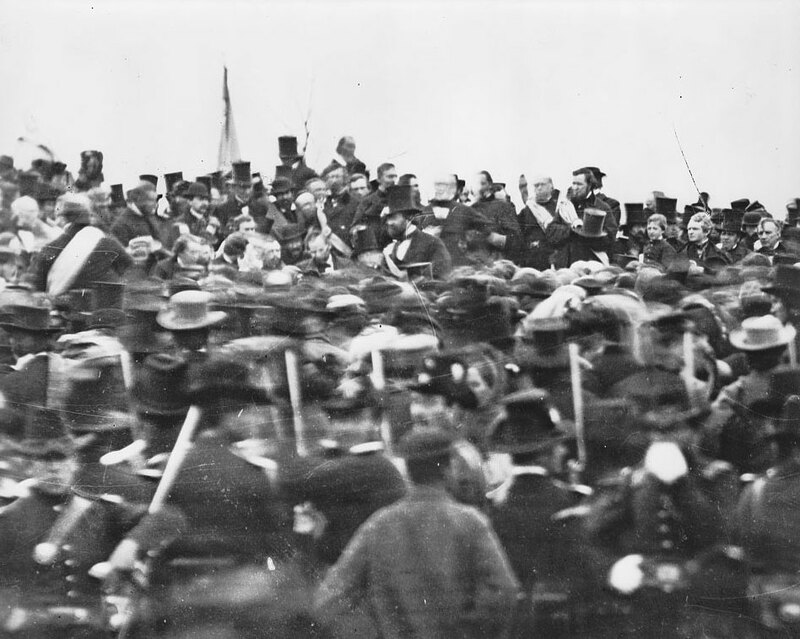 President Lincoln's brief speech, known as the Gettysburg Address, called for reconciliation and reunification of the United States and honored soldiers on both sides. While his speech may have seemed like propaganda to some people, it presented universal ideas. Indeed, breaking down the paragraphs, readers can note that the first paragraph talks of the past; the second paragraph, the present; and the third paragraph, the future, that is what Lincoln hoped for the entire nation. Though originally composed on White House stationery, he made changes. 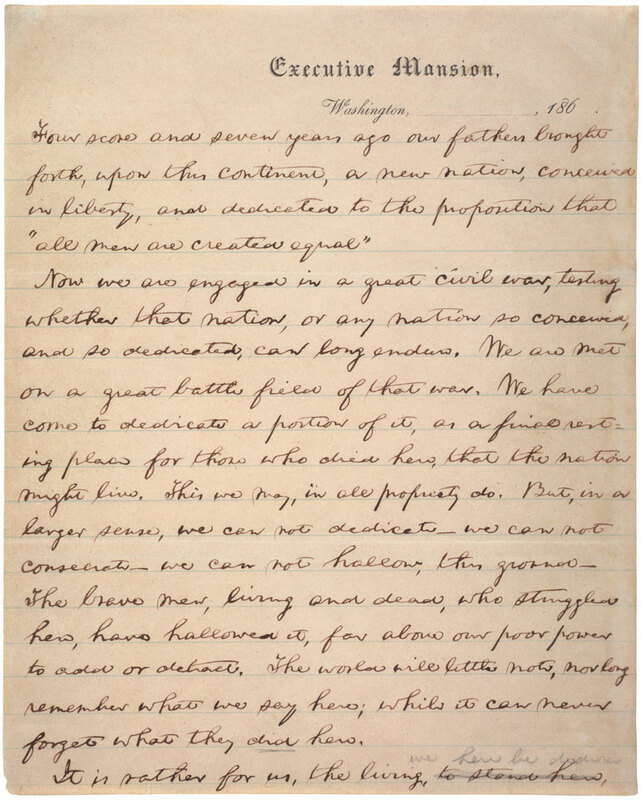 The actual document that was held by Lincoln at the time of the address is debatable because several copies and drafts exist; afterwards he made several versions as mementos and some were sold to raise money. 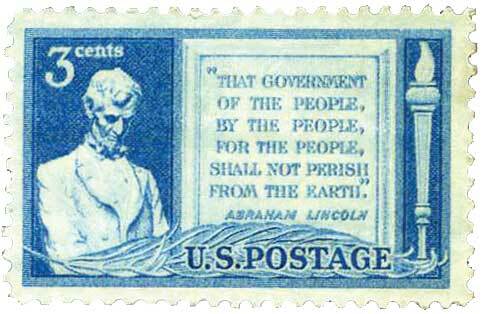 Commemorative 3-cent stamp, issued November 19, 1948, in remembrance of Lincoln's address eighty-five years earlier. Photograph of Abraham Lincoln at Gettysburg by Matthew Brady. The man in the center who is wearing a top hat is not Lincoln. Lincoln is sitting to that man's left without a hat.